I think one of the best by-products in politics are the people you meet along the way and I’ve met some great ones. 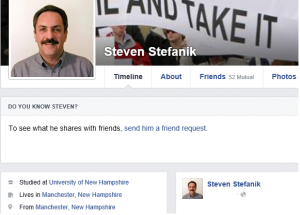 Unfortunately the counter by-product are the not-so-nice ones you meet such as Manchester resident and Ted Cruz supporter, Steven Stefanik (not to be confused with Amherst NH Rep, Stephen Stepanek). 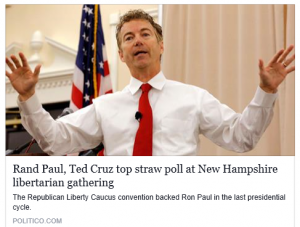 For some reason, Mr. Stefanik felt compelled to throw out baseless accusations and outright lies against Presidential candidate, Rand Paul, the winner of the Republican Liberty Caucus straw poll. Okay, I get it. Your guy lost, you’re angry over that, but seriously buddy? 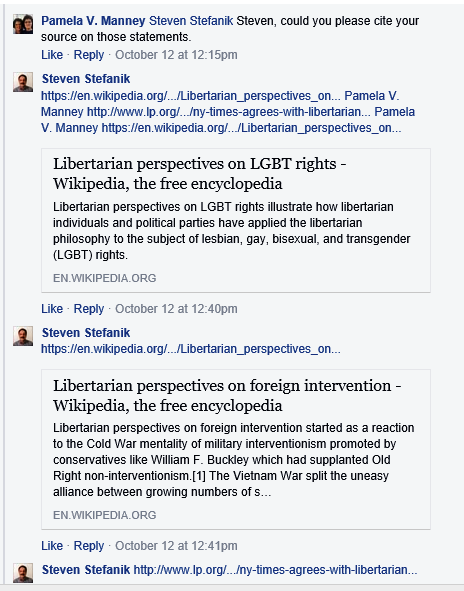 So, I challenged him to cite sources for his comment. What does he provide? 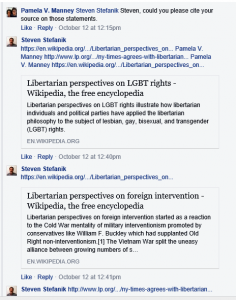 Wikipedia links to definitions of Libertarian views but NOT ONE source to back up his claim against Rand Paul, who is not a Libertarian. So, I question him on that. 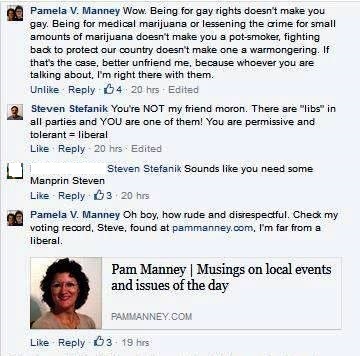 Pointing out that supporting gay rights doesn’t make you gay. Supporting medical marijuana and lessening penalties for said, doesn’t make you a pot-smoker and taking steps to protect our country against outside attacks doesn’t make you a warmonger. Irony is, Rand Paul is considered the opposite, but let’s not let the facts get in the way. 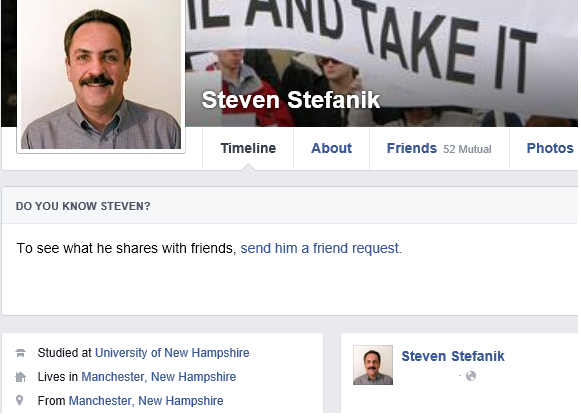 So, of course, Stefanik goes on the attack. Basically, calls me a permission liberal moron. Classic “losing an argument” response. I bring this up is because people like him are the problem with politics today. We have some great candidates out there. Some I agree with, some I don’t, but they’re all good people. 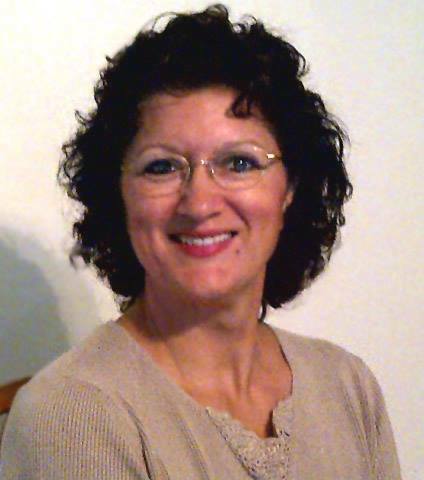 I’ve endorsed Rand Paul. I believe Rand Paul is what this country needs. But, do I bash other people because they support someone else? Of course not. That would be disrespectful, arrogant and grossly unprofessional and honestly, not good reflection on the candidate I do support. Folks, let’s stop the attacks, the bullying, the vilification of those that may not share our particular view. People like Stefanik are hurting the Republican cause and reflect badly on all we are trying to accomplish. It needs to stop and bullies and haters should be called out, marginalized and made clear they DO NOT represent who we are, which are hard working, grassrooting, volunteering folks doing all they can for their candidate. Let’s get back to the issues. Let’s get back to promoting the good our candidate will do for America going forward and not allow the gnats on the fringe to compromise our true identity and our plans for America going forward.